What if you could turn everything you touch into GOLD? Gods gave you the ability to turn everything you touch into gold. Take the opportunity to build an empire of unimaginable riches and become the first capitalist of the ancient world, an original tycoon! Champions are the Heroes of your Realm and it’s their duty to follow you on your adventure ! Unlock them and take advantage of their unique abilities in 3 different modes! Touch stones and they will be transmuted into gold. Build a city and upgrade it. Manage your kingdom from your castle, prepare for war, raid Mythical Cities and let your civilization flourish. Dead enemies, revived from the eternal oblivion and they are thirsty for blood. Grow your own pet to fight the dishonored enemies in blitz arena fights all around the earth and send them to the exile of the underworld. Level them up to fight even more powerful and evil enemies and obtain stronger pets. Enemy’s fallout will be inevitable. Food, upgrades and potions will help your pet evolve and boost its' power and soul to fight in the arena and ascend in the league. Achieving high ranks will give a great boost to your gameplay. Play the in-game events and optimize your gaming experience as well as boost your progress in the game. Grind them every day and collect all the Ancient Artifacts. King Midas, honor your gift and the world is yours! 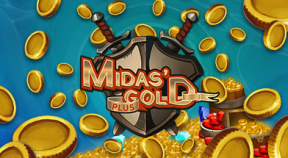 Midas Gold Plus belongs to the Clicker genre and revolves around the legend of king Midas. It is a fantasy game that you can play between other games' play sessions or while you are at work and want to spend 10 minutes having fun. Age is not a restriction for this game. Midas Gold is a fun time killer game which you will never regret downloading! Start over now!